The makeup, roles and responsibilities of each of these committees is described below. 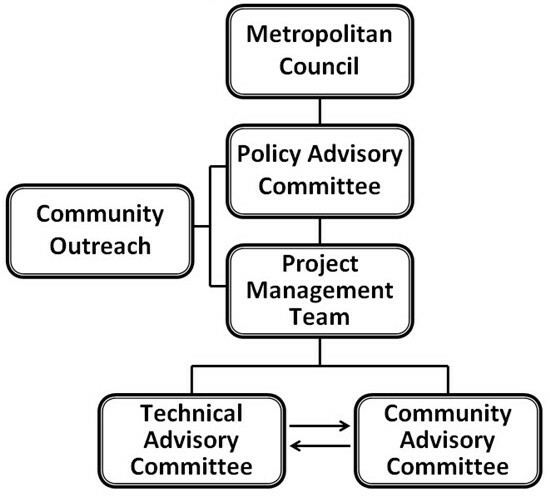 As shown on the right, the TAC, CAC and PMT inform the PAC, which will in turn passes along the Locally Preferred Alternative recommendation to the Metropolitan Council, where final decision-making authority rests. The PAC consists of policymakers, elected and appointed officials from the Metropolitan Council, Hennepin County, City of Minneapolis and other key partner agencies and organizations. The PAC participates in the overall direction and guidance of the study process, will discuss project alternatives and will make the final locally preferred alternative (LPA) recommendation to the Metropolitan Council. The PAC will meet at least quarterly for the duration of the AA and more frequently if needed to address specific issues. The PMT will provide meeting agendas and materials in advance, and will provide a meeting summary to record the discussion. This committee is made up of representatives from from the Metropolitan Council, Metro Transit, Hennepin County, City of Minneapolis, MnDOT and others. Its purpose is to provide technical guidance and assist in the resolution of technical issues in their field. It will not “vote” on the LPA, but will provide guidance to the PAC on which alternative is the most technically feasible. The TAC will meet at least bi-monthly for the duration of the AA and more frequently if needed to address specific issues. The PMT will provide meeting agendas and materials in advance, and will provide a meeting summary to record the discussion. The role of this committee is to bring a community voice to the AA planning process. The CAC is an essential connection between residents, property owners, businesses and employees in the project area and the planning process that will affect their community. Although the CAC does not have direct decision-making authority, it can make recommendations to the PMT and PAC which, in turn, will make recommendations to the Metropolitan Council. This team includes staff members from Metro Transit, the Metropolitan Council, Hennepin County and City of Minneapolis who are actively involved in the day-to-day management of the AA. The PMT will facilitate coordination among partner agencies, the Consultant team, the FTA and other project committees. The PMT oversees all technical work, the project schedule and staff recommendations to the TAC and PAC. The PMT will meet at least monthly for the duration of the AA. The consultant team will staff meetings, prepare meeting agendas in coordination with Metro Transit staff, and prepare meeting materials and summaries.